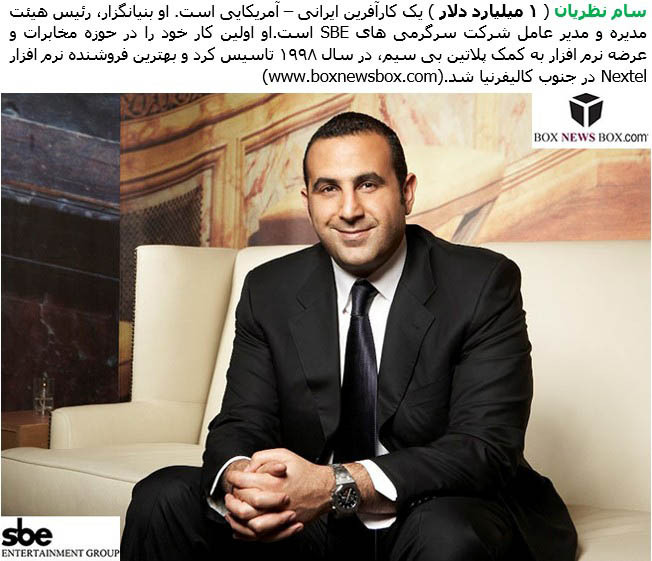 Sam Nazarian is an Iranian-American entrepreneur. He is the Founder, Chairman and CEO of SBE Entertainment Group.His first entrepreneurial venture was in 1998, when he founded Platinum Wireless, a telecommunications business specializing in the distribution of Nextel software. Within one year of its founding, Platinum Wireless was the number one Nextel distributor in Southern California. He then entered the world of real estate by diversifying his family’s assets into real estate holdings, beginning with the establishment of 3Wall Development in 1999. Nazarian’s SBE brand has also been featured on episodes of The Hills. Nazarian owns the Hyde Lounge at Staples Center in Los Angeles and he also owns the Hyde at AmericanAirlines Arena in Miami. In 2014, SBE agreed to lease the top two floors of 5900 Wilshire in Los Angeles. Dude, the article is in English, and so are the comments. What’s your problem? simply this give me so proud. what does it make any difference $8b or $100b , the point is what humanity or any contribute he has done to anybody. Simply its so much proud to see him did it right. Simply just shut up and learn some English!! Hi is Mancini a Persian Name? My old CPA’s name was Mancini, Italian. Mersi for your response. where is manny khoshbin on this list? And what if they “all” are, as you put it. Does that mean they’re not, or can’t be, Persian? Perhaps you don’t know, Persian Jewish people had lived in that land a thousand years before anyone called “Reza” invited himself over. Our wonderfull Jewish countrymen were always very hard working and smart. Well done dear Iranians. We are very proud of you and your achievements. Totes had a crush on him the first time I saw him on “The Hills”. Yay for wealthy Iranians hehe…. this list is incomplete, Parsis businessmen in India are also persian origin and some of them are richest in the world , e.g tata group, godrej group, shapoorji Pallanji etc. Is Bijan not worthy of the list – may he rest in peace. I thought he would be worthy of this list too… but I guess not..
Arash khan, Damet garm ! hope to have those People’s in the new Iran soon. To inrich Iran and iranian society every where in the World. Un homme en plus d’une générosité et d’une intelligence rare !! ازفضل پدر تورا چه حاصل .